Whilst researching this topic I was disappointed to see that we really haven’t moved on much scientifically in our ability to treat chronic pain and the sleep disturbances it causes. The same well meaning advice was trotted out in practically every website. Finding the answer to better sleep when you are in chronic pain is a frustrating business. So what’s the advice that the websites offer I hear you ask? – Reduce your caffeine intake in the afternoon / evening so that you get to sleep. That’s the same advice they give anyone who is having trouble sleeping and isn’t specific to those of us dealing with chronic pain. Reducing caffeine is a great idea but for me getting to sleep isn’t the major issue staying asleep is. – Make sure your bedroom isn’t too hot or too cold. Again I have to question what the hell this has to do with my sleep being interrupted by chronic pain? Quite often I will go to sleep with various heat wraps applied to parts of my body. All of them have an automatic cut off after 90 minutes. Without the heat applied to my rusty joints I would be in agony! I do like to sleep in a cool room and can’t abide being too hot. But again the advice is meaningless to those of us with chronic pain. – Make sure you develop a good night time routine. What they mean by this is that you don’t go to bed until you are ready to go to sleep. If you don’t fall asleep within 15-30 minutes your supposed to get up again. This has nothing to do with chronic pain! Insomnia yes but chronic pain ? Most of us with chronic pain sometimes have to go to bed early / during the day ( when I say sometimes for me its every night. In a perfect world I would be in bed every evening at 6pm, 7pm at the latest). Bed is the only place we can get comfortable, support ourselves etc by making this off limits would cause some people to suffer more pain. Unhelpful. -Make sure your bedroom is free from distractions. Most people with chronic pain use what is known as a distraction technique. This is where we try and focus on something other than our pain be it a DVD, Music, Books, Texting friends. I use DVDs and have box sets coming out of my ears but I love watching and re-watching them. It needs to be something I like and something I can get totally absorbed in. I’m writing this blog post in bed to distract myself from the fact my back has gone into spasm and will only let me move around a tiny bit. Pain can have some positive outcomes its not all negative! I have however implemented a new sleep routine, when I start to feel like I need to settle down and go to sleep I turn all electric devices off. The tablet, the phone etc all get switched off as from previous posts you know I am evil if my sleep is disturbed and it prevents me from checking my phone or tablet if it buzzes. I can then solely concentrate on the business of sleeping. The phone and tablet only get switched back on again when I get up in the morning or if I’m having a bad bout of insomnia. I do have a guilty secret though! I can’t sleep without the radio on. I listen to the world service, BBC radio 4 or BBC radio 4 extra. I find it soothing to hear constant voices and if I’m in pain its distracting enough to reduce the pain but not so distracting to stop me getting to sleep. Many people with chronic pain find night time the hardest as there is nothing to distract them from the pain as they try to go to sleep. So listening to the radio is a great tip! -Get some exercise during the day. Unfortunately for some people getting some exercise isn’t possible. For me exercise or any activity beyond the level I am used to is a no no! I know how much energy I have and I have to use it efficiently otherwise I end up stuck in bed due to a pots crash or I end up in severe pain. I know its important for me to keep mobile and keep my joints strong but I also know I need to keep within my limits. If you can exercise however small the amount do it, if you can’t don’t stress over it. You know your body! This is the only piece of advice that I actually agree with. I would also add clean sheets are a must! When I’m stuck in bed for days on end, hubby is a darling and changes the sheets after 3 days. Clean fresh sheets are a “thing” of mine, if I had the energy and the money I would have clean sheets every day! But I don’t so if I’m not stuck in bed once a week is fine. I bought a new mattress around two years ago as my old one was sagging and causing me to have a lot of back pain because it was no longer supporting me. I would wake up in the morning feeling worse than I did the night before. The new mattress was brilliant and my morning back pain reduced considerably. Then last summer I lost weight through not being able to eat solid food ( it was causing me awful stomach pain) the weight dropped off me and then my mattress started to feel like a concrete floor. Every morning my mattress had turned into an instrument of torture overnight. After a few weeks of trying various fixes ( lying on top of a double duvet etc) I could bear it no longer and I bought myself a memory foam topper. It was wonderful, the awful pain I was waking up with stopped. Now I still sometimes wake up feeling like I’ve slept on a concrete floor when I’m having an EDS flare but its not every morning. So there is something to be said about this bit of advice. Part three of sleep and chronic pain will be coming out later this week. You can now find me on facebook under The Myasthenia Kid. 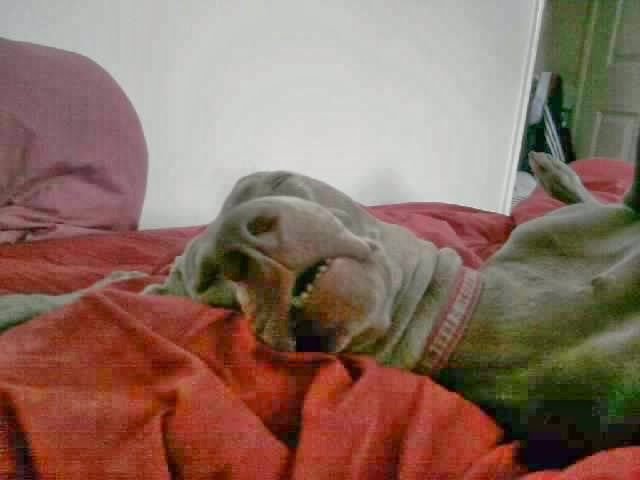 This is Willow asleep on my bed a few years ago. I think she looks a bit like ET!